With the new school year upon us, what better way to get off to a flying start than with our Top 10 educational Mind Maps created by real users. Take these ideas and use them as templates, posters or simply, be inspired to create your own unique maps. When introducing a brand new topic or subject to students, you want to remind them of the importance of the information you’re about to bestow on them. However, it’s often the case that you have to constantly remind your students of this throughout the school year. Try introducing your subject with a fresh approach. Ask your students to Mind Map why your subject is so important or even complete a group Mind Map as a class with everyone’s ideas incorporated. The aim of school is to prepare students for their future. Set your students the task of Mind Mapping what they want to be when they grow up. It works well with students of any age and it encourages your students to engage in critical thinking. Aspects of the map which your students should consider include the timeline (when do they expect to achieve their goal? ), requirements for their dream job (do they need certain qualifications?) and the steps they need to take to reach their targets. Parent’s evening has a habit of creeping up on you and before you know it, you’re writing tons of reports. Why not get a head start and create a Mind Map for each child at the start of the year. As the term continues, add branches to the Mind Map to build up a picture of their performance and development. The Mind Map itself will serve as a fantastic visual reference when discussing progress at parent’s evening. Note: The green branches signify strengths; the red branches signify weaknesses and amber branches signify areas for improvement. Essays and reports are an essential part of homework tasks and end of year exams. Instil your students with good habits by providing them with useful phrases for supporting and contradicting arguments. Throughout the year, your students can build on this as they encounter new and useful phrases for their work. Whether your students are 6, 16 or 60, everyone needs to start somewhere. Allow your students to get to grips with the fundamentals of a language by consolidating key terms into Mind Map summaries. Maps can include tenses, verbs, animals, numbers, family members and more. Once you have done this, you can issue it every year to your new group of students. At the start of term, it’s time to recap the basics and make sure your students are ready to tackle the tasks that the new term brings. 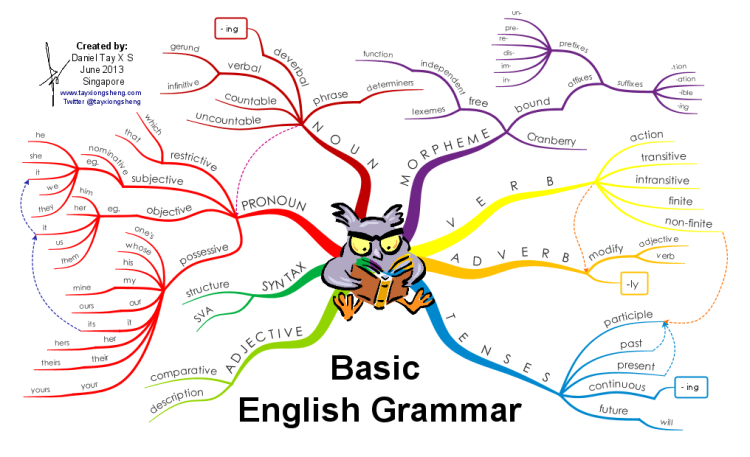 Use this Mind Map as a classroom reminder of the basics of grammar and see whether their writing style starts to change as they include more complex grammar in each writing task. Box branches in iMindMap serve multiple purposes but perhaps the most original is for fill-in-the-blank exercises. These work for every topic or language and serve as templates which can be used time and time again. At the end of the exercise, fill in the box branches with iMindMap projected onto the board so everyone can see the correct answers. Tip: Print off the exercise and issue to your students and if you think the questions are pretty tough, you can try including images as hints. With parents and teachers world-wide looking to tackle bad eating habits in their children and students, never has there been a better time to educate them on healthy eating. Print off this Mind Map and use it as poster in your classroom. This will really help you and your students learn about the importance of a balanced meal and show the creative potential of iMindMap. Mind Maps work very well for consolidating the more complex topics which often need to be broken down. In iMindMap, you can work in a limitless workspace where the Mind Maps you create can be as detailed as you require – something which can be difficult to achieve on paper. In addition, your students can edit and build upon their maps throughout the year. So when exam time arrives, your students have ready-made maps for revision. Plus, students can attach notes to each branch and add links to web resources so the basic points are essentially highlighted with additional core information just a click away. Finally, audio learning – a learning strategy which is often underestimated and taken for granted. Introducing audio into your lessons can have a huge impact on student development. Whether it’s music, language exercises or audio recordings to recap previous lessons, these can all be attached as audio notes in iMindMap. *In order to download the maps, you will need to have iMindMap 10 installed on your computer (or the free iMindMap trial). Interested in using iMindMap for teaching and learning? If you are interested in purchasing iMindMap for your school or educational institution, we offer significant discounts on educational site licenses. For more information, please contact our Sales team at sales@thinkbuzan.com. 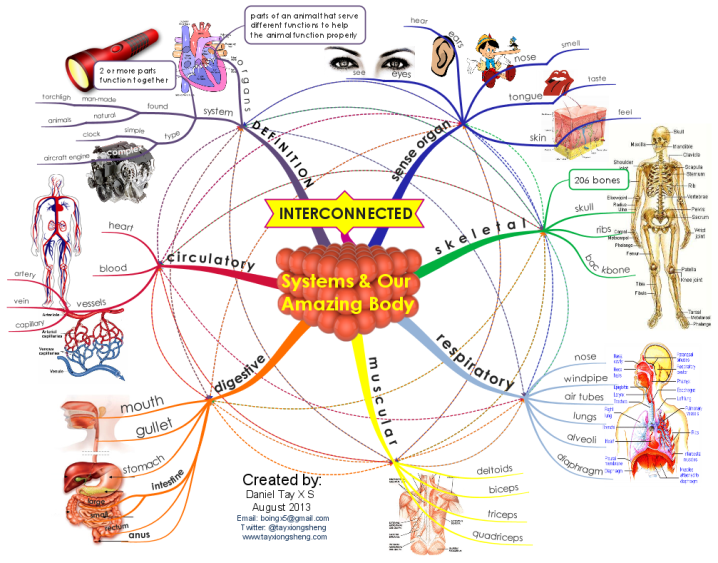 Don’t forget to visit our iMindMap Gallery to view more incredible iMindMap examples. Hi Cinzia, that’s great news. I am happy to hear that iMindMap has helped you and your son. If you upgrade to a newer version of iMindMap you will receive the download links for MAC version and Windows version. If you are using iMindMap Ultimate version you are able to install on two devices. With iMindMap Home and Student version you are able to install on one device only. In answer to your question, no you will not need to buy a second license if you are using iMindMap Ultimate. If you are using Home and Student you would need to purchase two licenses to install both the MAC and Windows versions. I hope this helps.